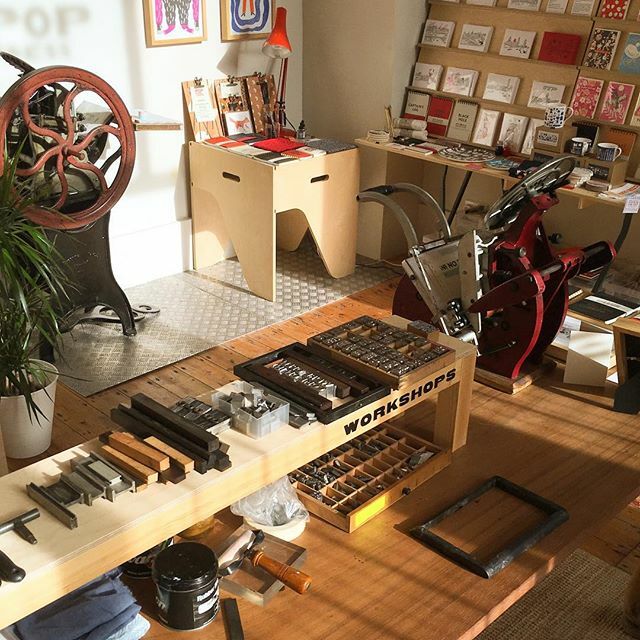 As well as selling Pop Press letterpressed goods, we have a selection of screenprinted goods from our favourite makers. From Charlotte Farmer's brilliantly illustrated musical icons to the genius of Otto Graphic's limited edition screenprinted screenprint manuals - order online or peruse inside the Pop Press shop at St. James's St, Nottingham. What is screenprinting and why do we like it so much? Screen printing is a stencil based form of printing. A rubber squeegee is used to pull ink across a fine mesh stencil which is forced through the open parts of the stencil, making the print. The flatness to the resulting print and how the layers of colours interact with each other is pleasing to the eye. Check the fluoro colours in the East End Press risograph prints and the modern but oh-so-charming riso cards and prints by Scout Editions in the Pop Press Print shop. What is risograph printing and why do we like it so much? Risograph is also a stencil based form of printing. The Risograph machine prints with drums of single coloured ink which are rotated at high speed, forcing ink through a stencil onto paper. Colours are layered on top of each other which may be slightly off register - giving an authentic, textural quality. We've started to collect some of the most beautifully engineered fountain pens and clutch pencils from German stationery brand Kaweco. We also have elegant pencils by Blackwing with interchangeable rubbers and handy mini aluminum rulers by Hightide. Also check out the precision, hand crafted TIDY with which to display your wares. Only in the Pop Press shop! Keep visiting as our stock is always changing.